A winning alliance of three high school robotics teams — Team 558, the Robo Squad from Hill Regional Career High School in New Haven, Team 177, Bobcat Robotics from South Windsor High, and Team 1699, the Robocats of Bacon Academy in Colchester, won Connecticut’s first-ever State Robotics Championship held May 11 at the Connecticut State Armory in Hartford. Beyond robot performance, a second honor, the Connecticut Choice Award, recognized the high school team that throughout the year has demonstrated the highest professionalism, sportsmanship, and citizenship, as well as creating a high quality robot. Chosen through a vote by all teams, this award was bestowed upon Team 195, the Cyber Knights from Southington High School. The Cyber Knights were also one of 10 Connecticut FIRST Robotics Competition (FRC) teams that qualified for and competed in the FIRST International Championship event held April 24-27 in St. Louis, Mo. Team 2170, the Titanium Tomahawks of Glastonbury, received the competition’s Play of the Day award for the team’s ability to adapt their robot’s strategy for challenges on the field. The competition’s second-place alliance – Team 2168, the Aluminum Falcons from Groton’s Fitch High School, Team 230, Shelton High’s Gaelhawks and Team 2064, The Panther Project of Pomperaug Regional High School in Southbury – gave the winning alliance a strong run for their money. Sponsored by the Connecticut Association of Schools and the Northeast Utilities Foundation in partnership with Connecticut FIRST, the event provided the opportunity for more than 40 Connecticut teams to go head-to-head in a Connecticut-only competition. 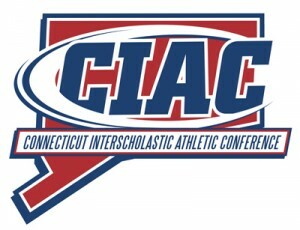 The Connecticut Association of Schools serve’s Connecticut’s K-12 public and parochial schools in all areas of inter-school activity. CAS has emerged as an informed leader in Connecticut’s educational system, providing services to Connecticut’s schools in areas ranging from academics to athletics. The association represents over 1,100 schools in the state. The Connecticut Association of Schools is a non-profit organization located in Cheshire, Connecticut. CT FIRST is the operating arm of FIRST in Connecticut, supervised by a regional director, and supported by a senior robotics mentor. A local executive advisory board, with members chosen for their experience, occupations, and relationships, share their knowledge and offer their skills to further the mission of CT FIRST. In 2013, CT FIRST has 45 FRC, 22 FTC, 178 FLL and 70+ Jr.FLL teams.